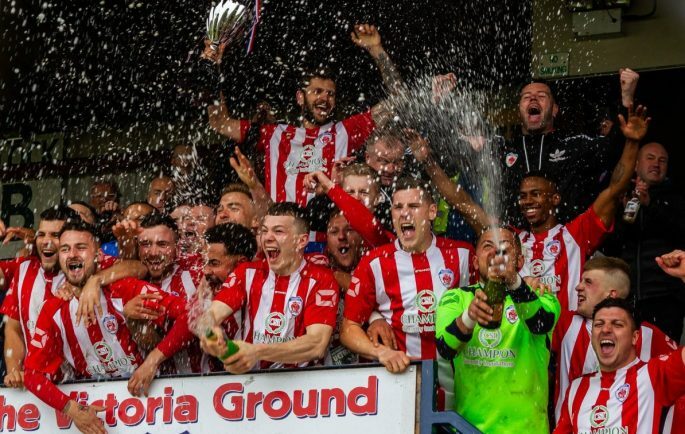 CHAMPIONS Bromsgrove Sporting brought the curtain down on a remarkable 2017/18 season with a resounding 5-0 victory over South Normanton Athletic. A bumper crowd of 1,145 packed the Victoria Ground to witness the Rouslers finish their Midland League Premier Division campaign in style. The league and cup double winners should have been at least 3-0 up within 15 minutes with Jason Cowley having a shot blocked on the line with the rebound from John Pykett also blocked. Shiners keeper Curtis Hall then had to be at full stretch to tip a Cowley header from Josh Quaynor’s corner over the bar. Despite their early dominance, Sporting fell flat for a small period with South Normanton coming close to taking the lead after 30 minutes. A blistering counter-attack led by John King was almost finished off by former Sheffield Wednesday and Nottingham Forest striker Marcus Tudagay, but Sporting keeper Reece Francis was quick off his line to save with his feet. And that miss proved costly three minutes later when the hosts took the lead. After Cowley was fouled 20 yards from goal, Sporting’s all-time leading goalscorer took the free-kick himself and with the help of a slight deflection, it flew into the back of the net. Six minutes later it was 2-0 when a long ball upfield by Francis was expertly controlled by Richard Gregory who curled a beautiful effort beyond the outstretched arm of Hall and into the far corner. After the break it took Sporting all of 40 seconds to add their third when R’Mary Murray’s sublime trickery allowed him to break into the box and cross to Pykett who had the easiest of finishes from close range. Gregory came close to adding his second and Sporting’s fourth just before the hour mark but a fine save from Hall kept the score at 3-0. Athletic never really troubled Brendan Kelly’s men in the second half and the points were sealed seven minutes from time when Cowley was on hand to squirm the ball over the line at the back post after connecting with Sean Brain’s low delivery. That took Cowley to 28 league goals for the season and puts him above Coventry Sphinx’s Ryan Harkin (27) in the race for the golden boot. There was still time for one more loud cheer from the Shed End this season when Murray poked home from Drew Canavan’s lofted ball two minutes from time to round off a comprehensive win for Sporting whose fans rushed onto the pitch at full-time to celebrate with the players.